New Zealand at the time of the Land Wars, through the eyes of a fearless critic: Thomas Grace, immovable champion of the Maori people, who knew him as Te Kerehi. A friend of Te Kooti, he sympathised with the Hauhau ‘fanatics’ and the King movement. He led his family on an epic wartime trek from Taupo to the sea, and later journeyed alone in hostile Maori territory. He opposed land sales and encouraged Maori enterprise. He attacked exploitation, injustice and indifference wherever he saw it: miserly fees for grazing Maori land, atrocities committed by imperial troops, poor pay and rotten flour for Maori road-building gangs, missionaries buying up land and turning to European service…the list goes on. Grace irritated the Government, outraged the settlers and embarrassed the mission. Some even said he should have hanged at Opotiki in place of the Reverend Carl Volkner. Yet his energy, compassion and many of his far-sighted ideas ring well in the 21st Century. This is the first publication of much of Grace’s writing. It is strong and passionate, but the book has a gentler side. His wife Agnes – “Mother” to the Maori – shared the building of the isolated Taupo mission. On the brink of war, she and her children were often alone in hardship and danger. Gentler too are Grace’s accounts of his journeys: hazards on the way, the scattered and often starving people, delight in meeting old friends and the courage of Pompey, his beloved horse. 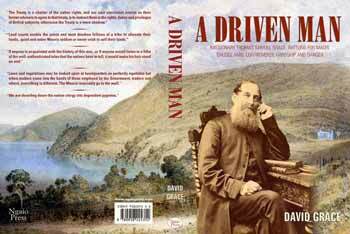 A Driven Man is soft-cover, and 391 pages, including colour and sepia illustrations. There are five maps plus extensive references and indexes. Available in bookshops and by mail-order from Ngaio Press, it sells for NZ$39.95, plus postage. "The Treaty is a charter of native rights, and our own consistent course as their former advisors to agree to that treaty, is to instruct them in the rights, duties and privileges of British subjects, otherwise the Treaty is a mere shadow"
Land courts enable the worst and most drunken fellows of a tribe to alienate their lands...quiet and sober Maoris seldom or never wish to sell their lands." "If anyone is acquainted with the history of this war...or if anyone would listen to a tithe of the well-authenticated tales that the natives have to tell, it would make his hair stand on end." "Laws and regulations may be looked upon at headquarters as perfectly equitable, but when matters come into the hands of those employed by the Government, traders and others, everything is different. The Maoris inevitably go to the wall." "We are dwarfing down the native clergy into dependent pygmies." David Grace is a great-grandson of Thomas and Agnes Grace, and a third-generation journalist. He worked first for the New Zealand Herald, then as chief reporter of the Daily Post in Rotorua. From 1960 until his retirement in 1987, he was on the staff of the New Zealand Wool Board, for 18 years as publicity director. For the next 12 years he published Shearing, a magazine for shearers and shedhands. He lives in Wellington.